12.0pt;line-height:115%;mso-bidi-font-family:Calibri;mso-bidi-theme-font:minor-latin">Other schools reported wildly different numbers from year-to-year, like Scottsburg Elementary School – which said it had 252 incidents during the 2014-2015 school year and then zero incidents the following two years. Assistant principal Debora Yost told Call 6 Investigates a former school employee “reported erroneously” the 2014-2015 data to the Indiana Department of Education. Call 6 Investigates also found at the fourth-largest school in the state, Penn High School in Mishawaka with 3,500 students, 20 incidents were reported in 2014-2015, 71 incidents in 2015-2016 and then no incidents in 2016-2017. Communications director Lucha Ramey checked and found the school misreported its bullying numbers. 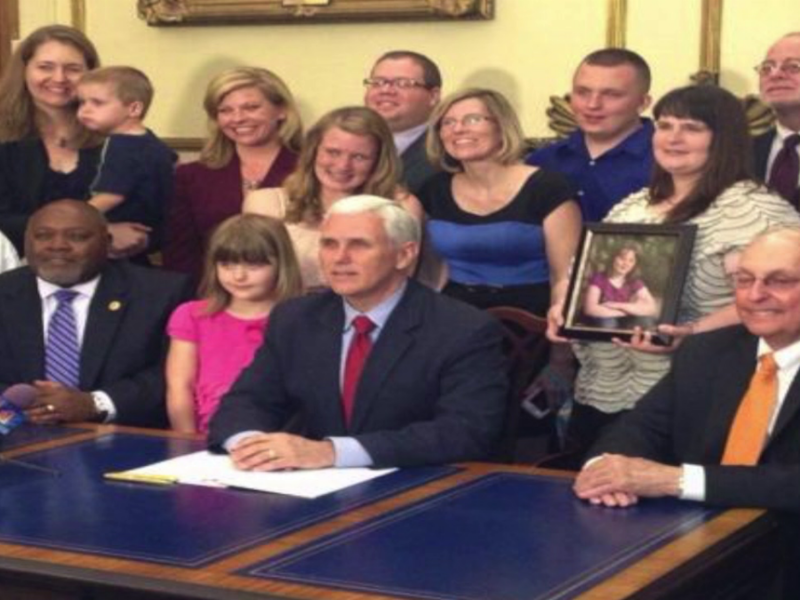 12.0pt;line-height:115%;mso-bidi-font-family:Calibri;mso-bidi-theme-font:minor-latin">On June 4, 2013, then-Governor Mike Pence signed the anti-bullying bill into law on amid cheers from child advocates – who said the law was necessary to track bullying cases and to prevent incidents. 12.0pt;line-height:115%;mso-bidi-font-family:Calibri;mso-bidi-theme-font:minor-latin">Angie Stagge, who now lives in Fairland, Indiana, fought for years to get the law passed and stood behind Pence when he signed the bill. Angie Stagge stands behind Gov. Mike Pence on June 4, 2013, as he signs HEA 1423 into law. 12.0pt;line-height:115%;mso-bidi-font-family:Calibri;mso-bidi-theme-font:minor-latin">Call 6 Investigates showed Stagge the bullying numbers, and Stagge broke down in tears when she saw all the zeroes. "...they told her to kill herself, hand herself, and they beat her up in the bathroom." Stagge said the idea behind the law was for schools and the state to track how often students are bullied, and hopefully, prevent it from happening in the first place. color:#212121">Amanda Snapp and Tammy Dyson both said their children were victims of repeated bullying within the Perry Township school system. 12.0pt;line-height:115%;mso-bidi-font-family:Calibri;mso-bidi-theme-font:minor-latin">“They threatened to kill my daughter,” said Dyson. 12.0pt;line-height:115%;mso-bidi-font-family:Calibri;mso-bidi-theme-font:minor-latin">Snapp and Dyson said they repeatedly reported the bullying to school officials. 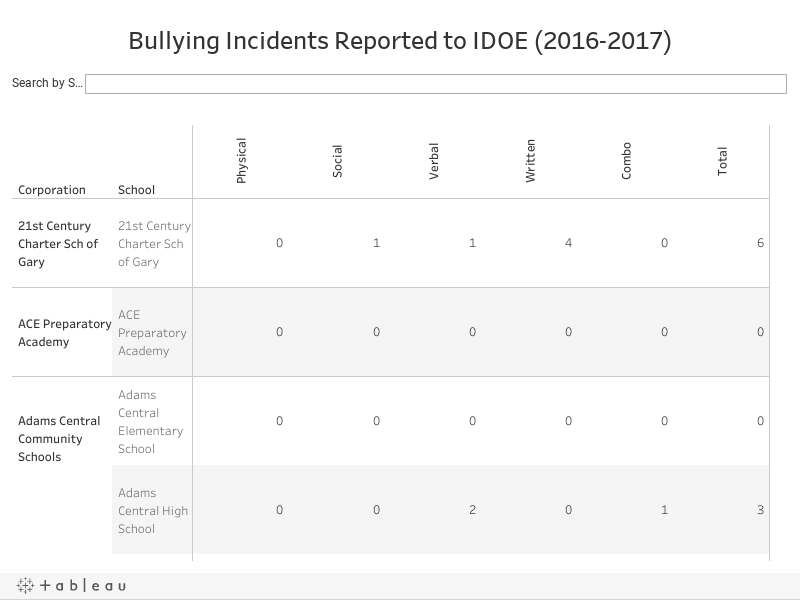 12.0pt;line-height:115%;mso-bidi-font-family:Calibri;mso-bidi-theme-font:minor-latin">A review by Call 6 Investigates found that nearly two-thirds of Perry Township schools didn’t report any bullying incidents last school year. 12.0pt;line-height:115%;mso-bidi-font-family:Calibri;mso-bidi-theme-font:minor-latin">One of those schools was Southport High School, which said it had zero bullying incidents for the same time period when Dyson says her daughter was bullied. 12.0pt;line-height:115%;mso-bidi-font-family:Calibri;mso-bidi-theme-font:minor-latin">At Southport Middle School, administrators reported zero bullying incidents to the state during the 2015-2016 school year – the same time frame in which Snapp said her son was tormented. "To say there had been no reports of bullying couldn't be farther from the truth." 12.0pt;line-height:115%;mso-bidi-font-family:Calibri;mso-bidi-theme-font:minor-latin">Dyson said the bullying got so bad, she filed a police report. 12.0pt;line-height:115%;mso-bidi-font-family:Calibri;mso-bidi-theme-font:minor-latin">“It’s a real kick in the face, it really is,” said Dyson. Instances of bullying are entered into our school management software by each school’s principal or administrator. The software program automatically generates a report that is sent to the Indiana Department of Education. The statistics you received reflect that data. The stats you received also signal that our Positive Behavioral Intervention & Supports (PBIS) initiatives are having a favorable impact on our school environments. PBIS is designed to improve social, emotional and academic outcomes for all students. Click here for more information. Administrators follow guidelines provided by the IDOE in regards to the definition and reporting of bullying. We encourage students to report bullying or any disagreement in which they feel threatened by telling a school official or calling our Safety Hotline at 317.789.3905. Once a report of bullying is received by an administrator, teacher or other staff member, an investigation is initiated within one school day. Perry Township Schools is committed to providing a safe, positive and nurturing environment for all students. mso-bidi-theme-font:minor-latin">Kara Kenney wanted to speak with Superintendent Pat Mapes, so Kenney showed up twenty minutes before a public meeting and asked Mapes if the bullying numbers are accurate. 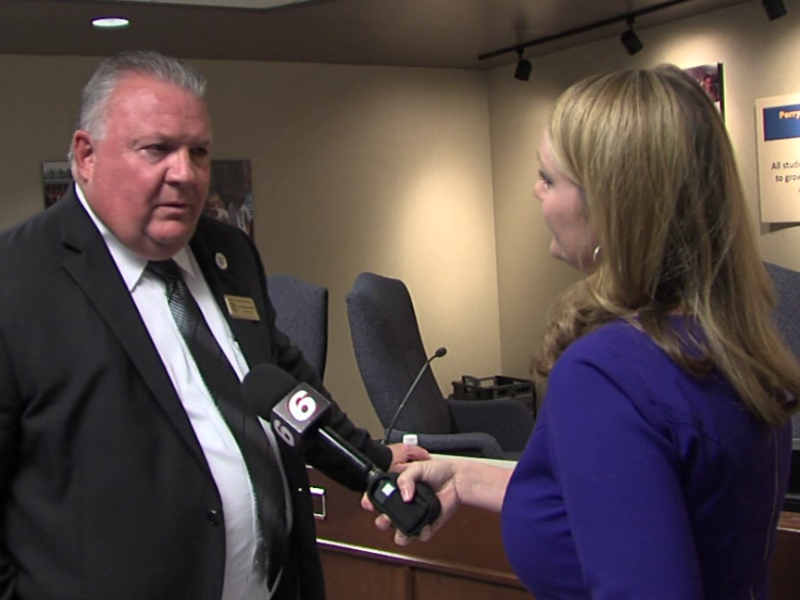 Call 6 Investigator Kara Kenney asks Perry Township Superintendent Pat Mapes about his district's bullying numbers at a school board meeting. mso-bidi-font-family:Calibri;mso-bidi-theme-font:minor-latin;color:#212121">Mapes emphasized Perry Township’s numbers reported to the state are substantiated bullying cases. color:#212121">says it has to be repeated, with the intent to harass, ridicule, harass, humiliate, intimidate or harm the targeted student and create a hostile school environment. mso-bidi-font-family:Calibri;mso-bidi-theme-font:minor-latin;color:#212121">Mapes said they’ve been working hard to train students on how to detect, report and prevent bullying. "We have students who monitor this and resolve conflict, and that's working, and our numbers prove that it works." mso-bidi-theme-font:minor-latin">Kara Kenney thanked Mapes for his time and started to leave. mso-bidi-font-family:Calibri;mso-bidi-theme-font:minor-latin;color:#212121">“You’re more than welcome to set up an appointment time instead of just rushing in,” said Mapes. But Kenney had tried to set up an appointment in a Sept. 14 email to Superintendent Mapes and the district’s communication director, Keesha Hughes. mso-bidi-font-family:Calibri;mso-bidi-theme-font:minor-latin;color:#212121">“The email I sent said in lieu of an interview,” Hughes said to Kenney before the board meeting. mso-bidi-font-family:Calibri;mso-bidi-theme-font:minor-latin;color:#212121">“Great way to do it,” Mapes responded. mso-bidi-font-family:Calibri;mso-bidi-theme-font:minor-latin;color:#212121">Despite Call 's questions, Perry Township says it stands behind its bullying numbers. 12.0pt;line-height:115%;mso-bidi-font-family:Calibri;mso-bidi-theme-font:minor-latin">Unlike Perry Township Schools, Indianapolis Public Schools did agree to a sit-down interview with Call 6 Investigates. 12.0pt;line-height:115%;mso-bidi-font-family:Calibri;mso-bidi-theme-font:minor-latin">IPS, the largest district in the state, was one of several districts a Call 6 Investigates analysis found had misreported bullying numbers to the state. 12.0pt;line-height:115%;mso-bidi-font-family:Calibri;mso-bidi-theme-font:minor-latin">Last year, two-thirds of IPS schools reported zero bullying incidents. At George Washington High School, not a single incident had been reported over the past three years. 12.0pt;line-height:115%;mso-bidi-font-family:Calibri;mso-bidi-theme-font:minor-latin">IPS spokeswoman Carrie Black said those numbers are wrong – calling it a reporting error. "We hate that it happened. We regret that it happened. But we own it." 12.0pt;line-height:115%;mso-bidi-font-family:Calibri;mso-bidi-theme-font:minor-latin">"It was an oversight, a very unfortunate oversight,” said Black. “We hate that it happened. We regret that it happened, but we own it." 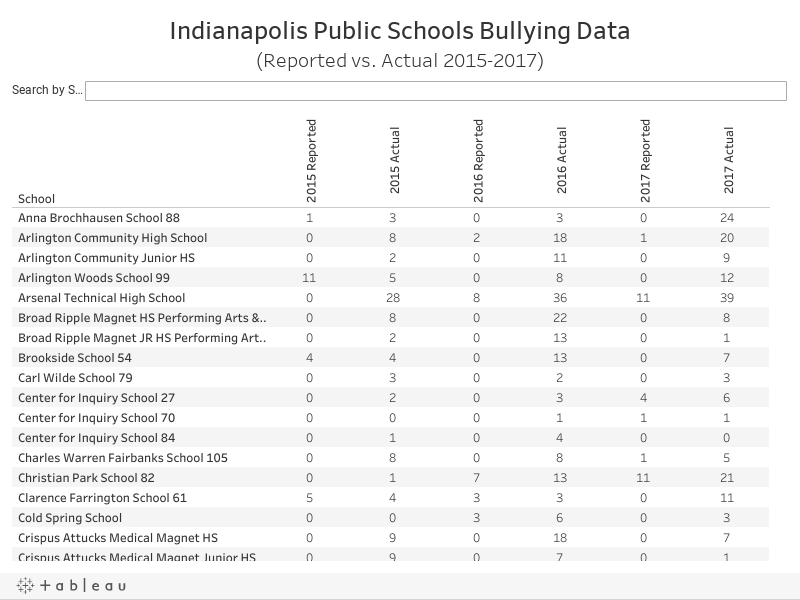 12.0pt;line-height:115%;mso-bidi-font-family:Calibri;mso-bidi-theme-font:minor-latin">Black said IPS has been recording bullying incidents at the school level. She said the state requested extra information, and the district was unaware of the new category. 12.0pt;line-height:115%;mso-bidi-font-family:Calibri;mso-bidi-theme-font:minor-latin">"The schools were keeping the numbers, this was more of an upload situation,” said Black. “This was an upload error in what was being sent to the state. " 12.0pt;line-height:115%;mso-bidi-font-family:Calibri;mso-bidi-theme-font:minor-latin">District-wide, IPS reported 88 incidents for the 2015-2016 school year. After inquiries from Call 6 investigates, IPS now says the correct number is 519 – meaning the district underreported incidents by 490 percent. 12.0pt;line-height:115%;mso-bidi-font-family:Calibri;mso-bidi-theme-font:minor-latin">Last year’s numbers were also off, IPS says. The district reported 245 incidents, but says there were actually 689 – a difference of 181 percent. color:#212121">The district has improved its procedures to make sure they report bullying accurately moving forward, including by adding a daily and monthly check. color:#212121">The Indiana Department of Education uses the schools’ bullying numbers to track what’s happening and to look for red flags. color:#212121">The state also shares the bullying data with the legislative council and the Indiana Criminal Justice Institute. color:#212121">But, Call 6 Investigates found there’s no teeth in the bullying law. color:#212121">The state has no way to punish school districts who fail to report or who misreport bullying incidents. color:#212121">What’s more, Call 6 Investigates found flaws in the state’s own bullying data, which is now prompting the Indiana Department of Education to make changes. color:#212121">Call 6 Investigates found schools missing altogether from the state’s bullying report database, something the state seemed unaware of until we pointed it out. color:#212121">“I would say it was definitely missing some pieces,” said David Woodward, director of school building physical security and safety for the Indiana Department of Education. color:#212121">Woodward explained some schools mistakenly believe the system would automatically enter a zero if they didn’t input anything, which meant some schools disappeared altogether. color:#212121">“I think the schools believed their data collection was going to plug it in, and it didn’t,” said Woodward. color:#212121">Call 6 Investigates asked Woodward if it was possible for so many schools to accurately report zero bullying incidents. color:#212121">“It wouldn’t match the national averages,” said Woodward. color:#212121">Studies show 17 percent of American students report being bullied at least twice a month, and 70 percent said they’ve witnessed bullying in their schools. color:#212121">Woodward said schools are often left to sort through wars of words on social media. "We take this very seriously. Whether the data may or may not say it, your administrators are working the best they can to improve the climate of their school." color:#212121">“It's so difficult to track because rarely is it a clean break that this kid was a bully and this kid was a victim,” said Woodward. “Tracing that back to the beginning and holding just one person accountable when there's ten, it becomes a lot more of a conflict resolution issue rather than a classic bullying issue." color:#212121">Schools have to follow the state’s definition of bullying, but every school may interpret the law differently. color:#212121">Woodward said while they do not systematically review or enforce the accuracy of schools’ bullying numbers, they do help districts with bullying training. color:#212121">IDOE also looks at the schools’ bullying protocols and procedures. color:#212121">“We spot check, yes, but we don’t say what about this student or what about that student,” said Woodward. color:#212121">After Call 6 Investigates pointed out flaws in the state’s data, the state updated its bullying numbers and re-posted it on IDOE’s website. “We take this very seriously,” said Woodward. mso-bidi-theme-font:minor-latin;color:#212121">Whether the data may or may not say it, your administrators are working the best they can to improve the climate of their school." color:#212121">The state is also making changes to make sure schools accurately report how often students are bullied by adding an extra step when school administrators enter the data. color:#212121">“We're putting in some safeguards, so when a school does put their data in next year a box will come up and say ‘you reported this number of bullying incidents, is this true and accurate?” said Woodward. “That way, it's almost like a verification of the data twice." color:#212121">Parents of bullied teens say they want schools and the state to take bullying seriously and report accurately when students are bullied. color:#212121">“Make your kids feel safe in the schools,” said Dyson. “It upsets me. color:#212121">Parents said they’re left to wonder if the anti-bullying law is having any impact at all. color:#212121">Woodward said the law is having an impact, because it requires an anonymous reporting piece that encourages students to report not only bullying but also a friend considering suicide. color:#212121">“That’s a huge piece to the law that ends up benefitting students all around the state,” said Woodward. Don't think the numbers add up? We want to hear about it. Contact authors Kara Kenney ( kara.kenney@wrtv.com ) and Jordan Fischer ( jordan.fischer@wrtv.com ) and let them know how your school's data matches your experiences.